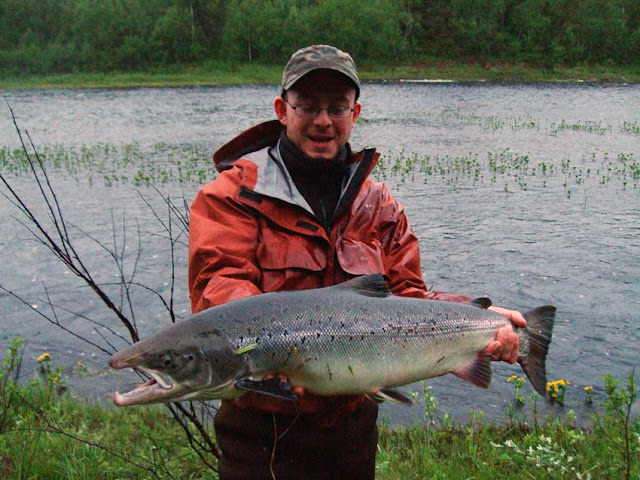 Chavanga Fish Blog: Salmon fishing in Russia. What I think of fishing salmon. Parts 1 - 2 - 3 and 4. Salmon fishing in Russia. What I think of fishing salmon. Parts 1 - 2 - 3 and 4. What I think of fishing salmon. I put my spinning aside in 1986 and tried salmon fly fishing. I was very interested in the types of salmon flies by that time. It wasn’t a secret for the anglers that salmons are omnivores. It grabs the spinners, wobblers, willingly eats worms and picks up things quite inedible. Most of the baits imitates nothing similar to actual nature livings and were never seen before by the fish. So, is there any sense in using different variety of baits if salmon eat everything that goes to the water. But among the fishermen were anglers who asked why the salmon is attacking an artificial fly? I am not against such a statement of the issue. On the contrary, the whole theory and practice of fly fishing emerged and flourished in search of an answer to the question why fish react to the fly. I still would not have to point if the arguments about salmon fishing went down this way. Unfortunately, the next is always a question of "salmon" flies and where to get it. This way of thought does not seem to me naive, since forcing all of our relationships with the fish to be based only on "salmon" fly. Such an attention to a small group of artificial flies now seems to me one-sided. I started getting to salmon fishing without a theoretical school. By that time in the USSR we did not have enough sufficient information on salmon fishing. Therefore, there was no persistent stereotypes. I understood that there is such a theory of balance between the role of flies and the role of its presentation in the water. With that statement, few would argue, because it's pretty obvious. But when fishing salmon, "salmon fly" actually becomes always the first to think about. And, as a rule, analysis is based on looking for an efficiency of fly fishing flies. As far as I experienced, most anglers tie they blank days and defeats first of all with fly fishing flies. What is the behaviour of an angler we can observe on the bank of the river. Typically, the only response to failure - to change the fly. Discussion of technical aspects of fishing relegated to the past role and this injustice disturbs me. Historically, the variety of flies was produced under certain modes of presentation. In the same group of flies, the difference in performance can be quite noticeable. All these variations wish to be explained by the author, who understands what it is. After all, each fly has its own place and the best way of presenting, cast and its own tackle. It all begins with an assessment of fishing spots, with the nature of water and the mood of the fish. If our task is to catch a fish, it is necessary to imagine how to do it correctly. The combination of a suitable fly and its proper presentation gives the best result. This is the essence of fly fishing, its universal meaning, and the universal goal of all efforts - to present a fly to the nose of the fish. In most cases, we fish salmon the same way, using the classic wet flies. We cast down and across the stream, picking up more speed, direction and depth. This method has a lot of nuances, details that are difficult to explain. Much is very subjective, and therefore said that the angler must be born. For example, sometimes they say about biting anticipation. Arm feels a special position and power of line, and then actually biting. So the essence of rod, line and flies work together for a kind of harmony that is suitable for a fish, then our hands remember it. Then, intentionally or automatically, we try to repeat this combination. The method of wet fly in all the different methods of presenting is quite effective. "Salmon" fly in the usual, customary execution, created just for this technique. For example, my son George fish perfectly in that style. I would not define his ability of fishing during the day or whole trip. Watching him from the side, we can say that he manages to navigate the situation on the water and intuitively choose the correct fly operation. It is unlikely that he can explain the nuances of what is happening and why, mostly often talks about flies like an anatomical exhibits. I did not manage to achieve such stability, so I'm more inclined to change something and to touch, be it gear or flies. Especially if this compels the river. In June 2010, couple of hot days warmed the river Chavanga unusually early. But the river still remained high in spring and little bit turbid from the admixture of peat. This combination is not a favourite for the fish. Usually, we use smaller and modest flies. But that time, fish wasn’t interested in it at all or we were fishing technically incorrect. I thought that salmons didn’t like the large flies, and I couldn’t present little ones as I wanted to. Couldn’t get them in the correct position in the water. I already had some experience in fishing by usual wet flies, which are unlikely to carry to salmon lures. 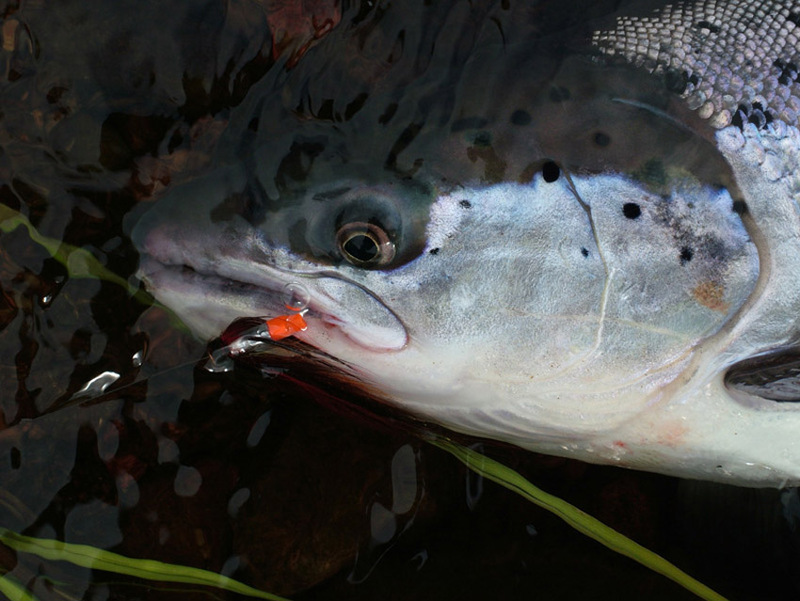 For example, flies treated with a metal head are always a good idea for salmon, which could play a provocative role or serve as a simulation part. In some cases, metal head improves the presentation. Fly is easier to keep on course or in the deep places where the level is not easy to get to the fish nose. It would seem that a few hundredths of a gram, but for small flies it`s a huge difference. An additional 15 - 20 cm depth is essential to such lures. But in a high, and even muddy water standard options not seems to be effective. If we go down this way, then to apply flies closer to the fish, I had to tie them to the tungsten heads. Only by their weight, I can explain the revival of salmon interest to those flies. Differences between some wet flies and nymphs are rather conventional. Moreover, the difference between classification groups sometimes does not define the anatomy, but method of fishing. 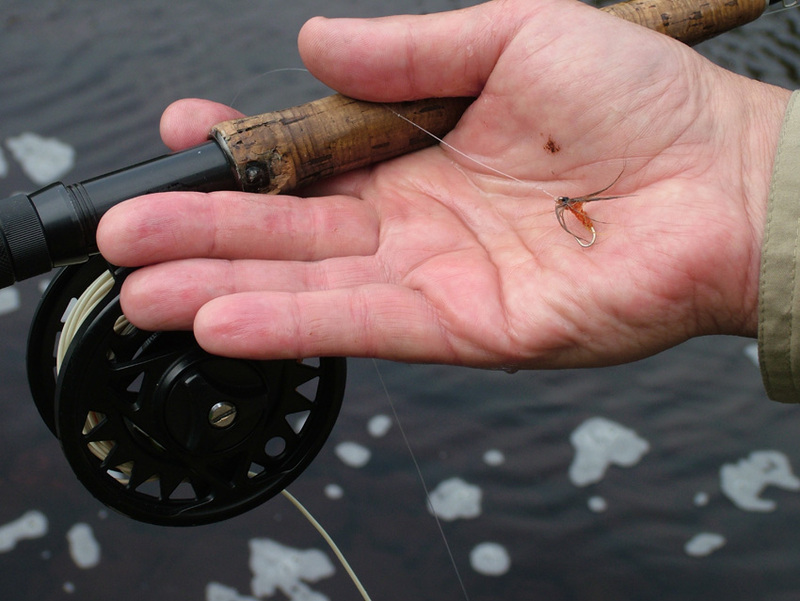 When the hand takes a tungsten bead head, it became clear that fly grew out of wet and it's time to use it as a nymph. And do not cast across and down but cast it up stream, making a regular nymph cast. 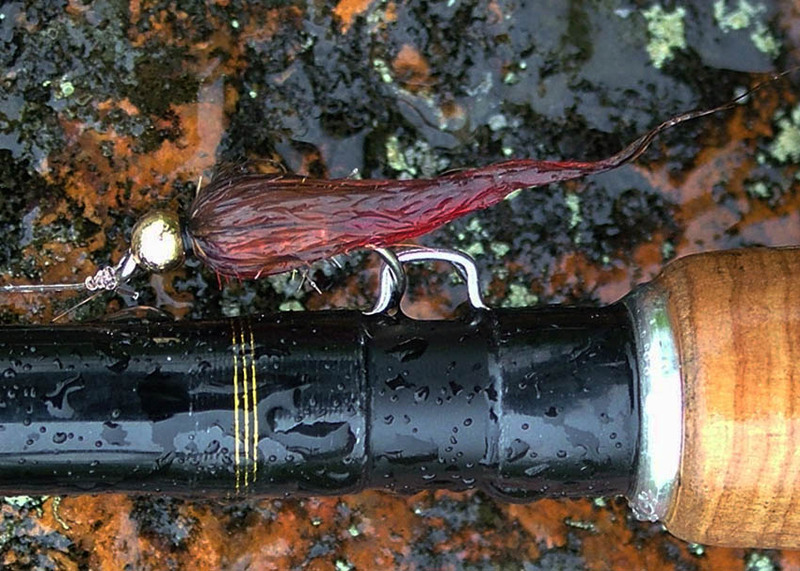 Go beyond the usual fishing with wet fly was not only effectively, but also interesting. I am not going to intend to use nymphs anywhere, anytime. Just, I point that after a week the effectiveness of the nymphs significantly decreased. Water brightened, the level gradually returned to normal and the advantages of wet methods in terms of area became the first to think about. However, such a decision during difficult fishing period, showed that when it comes to fishing for salmon, but not the "salmon" flies, it is possible to outperform the standard methods. This pair, fly and corresponding method of presentation is quite variable, and it should be found directly on the river. Sometimes it is difficult to understand the preferences of fish, it is not easy to take into account all the nuances of the changeable water. But it happens that situation is obvious and problem lies only in our indolence and dependence on the developed techniques. This long introduction is written with the purpose to convince myself and others that Atlantic salmon is not unique nature full of mysteries. There is no need to break their heads and hands, wondering "why salmon is attacking an artificial fly?" 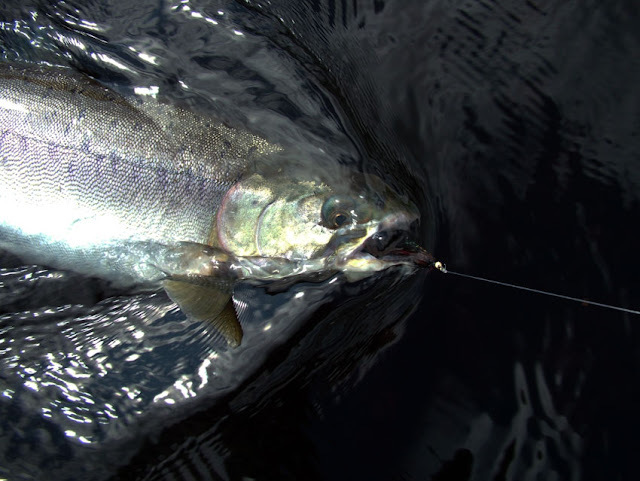 Salmon has always been and hopefully will be just a fish with its own set of instincts, which determine its reflex motion in the form of our flies, spinners and other lures. Sorry, but so far the idea that salmon in the river "is not hungry, not eating and not looking for food is dominating among the anglers." 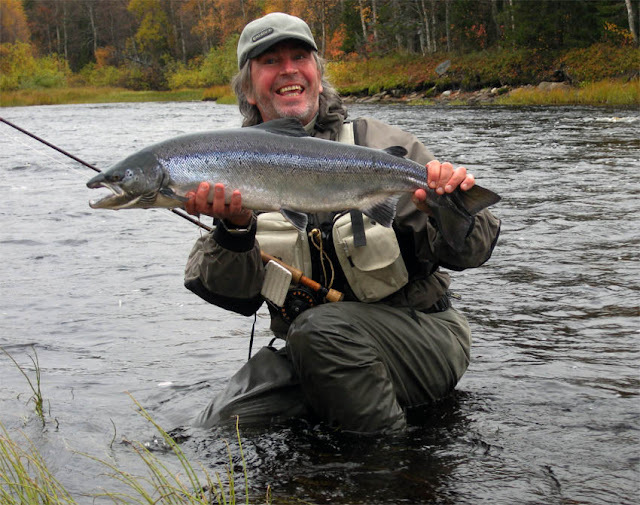 For example, Malkolm Greenhalgh in articles for the magazine "Fly Fishing and Fly Tying» on this basis concludes inappropriate efforts to study this subject and, moreover, on practical fishing on these flies. This idea pushing us to look for successful way of salmon fishing in the area of only salmon flies, salmon fishing tactics and techniques. The shortcomings of this approach created an inflexible mass confusion regarding the motives of the salmon. These meetings led to a variety of salmon flies with blurred practical sense. Their classification, but rather, the division into groups can be understood if we are talking about the hooks, fly tying tips and tying materials. Someone said that salmon flies exist as a mixture of impressionism with expressionism, and reflect our purely subjective approach. I want to develop this theme by another example. Some experiments seem to be devoid of practical sense, absurd. I'm talking about fishing the salmon with small dry flies, breaking the border and traditions of salmon fishing. To fish salmon as any small fish is contrary to salmon nature itself. If we were talking about the bomber, and another provocateurs, then it would not be worth to mention that. Salmon interest to the objects on the surface - an old story and not just peculiar to the rivers of the north Kola Peninsula. Salmon intend to show the same curiosity everywhere to a variety of subjects, moving on a surface. Bomber is the only known version of the surface lures. Spinning metal spoon works well on the surface too. Better known version of the opposite method- to catch in depth, but there is a working method of sliding spinners. About 20 years ago, I was also surprised by this "phenomenon". It is unclear why the fish is activated by only spinner come to the surface with a wave. 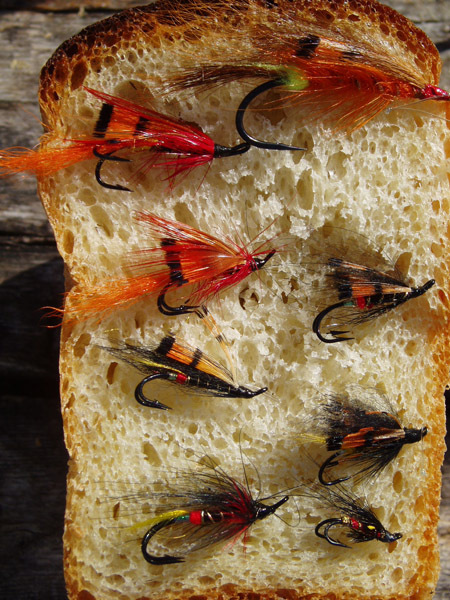 Bomber is intermediate between the weighty spinners and small-sized artificial flies. Its size and buoyancy were suitable for the traditional salmon tackle. But I think it is not a fly, the thing is in the furrow. Furrow attracts not only salmon, as well other fish react in a same way. About “bombing” as a method of fishing we were talking in correspondence with an acquaintance fisherman. He drew attention to the fact that the blow flies on the water can be used specifically for the provocation of salmon. Earlier, I saw that reacts to blow flies trout or grayling. Obviously, the salmon often attacks fly at once in the fall of the water. But how to use this technique specifically, I had no idea. Technically, everything looks easy, just knock on the surface should be clean. 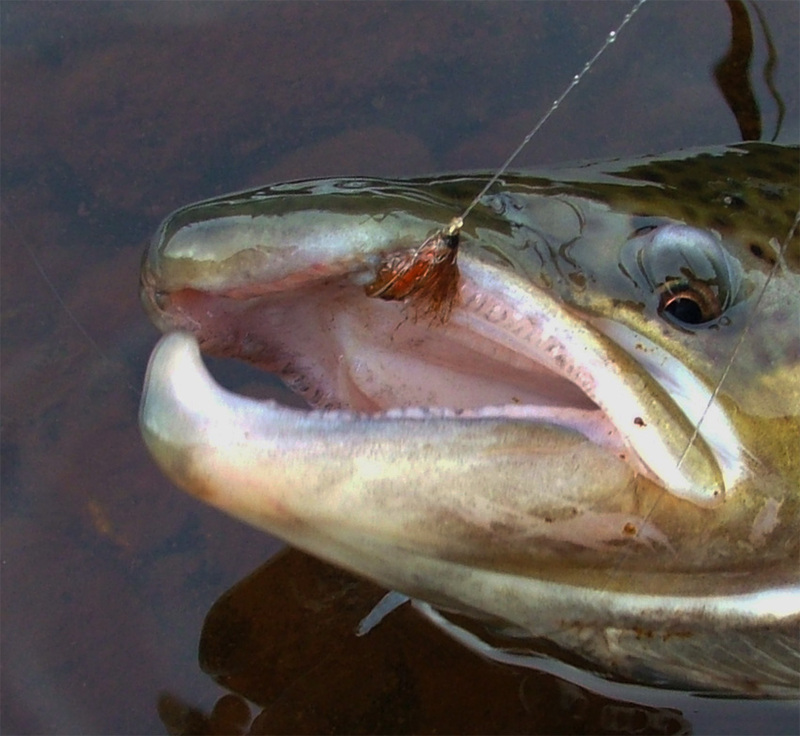 Salmon does not respond to fly when line hits the water. The first cast is often the most important. If we are correcting the position of the line or use false casting, repeatedly striking a line on the water, the salmon interest to the surface is rapidly disappearing. Particularly high requirements for casting technique are during periods of low water levels. It happens that plowing bait is not the only reason which attracts interest, which effect is almost natural, but persistence of using naturally drifting fly. Episodes of the past with salmon biting on the dry fly made me think of it as accidental, and wasn’t trying to give them a streamlined look. I still can’t organize the salmon interest to a dry fly. Element of provocation of a small caddis or mayfly is rather questionable in my opinion. The motive for the salmon to attack may not be aggressive, but curiosity or interest in food items. Early view of the need for the large-size fishing flies in the classic English literature was prevailing. Since the early 20th century there were a lot of data about greater efficiency of small flies. But the reasons for success are unclear, given the sporadic supply of salmon, perhaps even if it belongs to this population. Elements of aggression to the petty fly play certainly a minor role. We tried to find the details of fish behavior as an example of an exponential population of salmon in Chavanga and Strelna. Since 2008, we are helped by the French fishermen from GP Voyages Chasse et Pêche. While the study covers an insufficient number of fish, small segments of time and limited areas of the rivers. But an attention to the salmon food facilities should not be ignored. If we are talking about the practical application of conscious realistic simulations, we can only make general conclusions. The ratio of the potential food depends on the stern features of salmon populations, the place of spawning periods, time of fish flow. Also a life stage of salmon in the river has its own meaning. We should also take into consideration the size of the river, the water level, the availability of food. Unfortunately, there is no such information in a systematic form for us. But hopefully the chance of it to occur is still exists. Different variants of the "dry" fishing techniques may be very effective, although they are mostly applied during the summer. It is considered that at this time salmon are more likely goes to the surface. But people usually say that the activity of salmon is reduced in warm water. The activity of responding to the bait is getting low. Then we think that the thing is just in the low water level and correct methods of fishing, for example where the smaller drains in front of rifts. 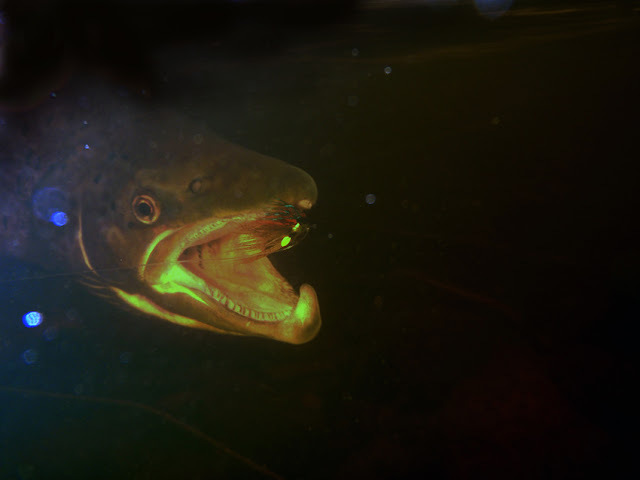 But the salmon also react to the fly in the deep places, and not only in summer, and so on. Using these contradictory dogmas it is hard to find any meaning in the fish behavior to a dry fly. Maybe that's not the fish, and in the summer we just more inclined to rebuild a fishing rod in an easy way, pampered trout and grayling, and at the same time experimenting with salmon. This year, we used another method of salmon fishing at the surface. Conditions of rivers changes cyclically. 2010 and 2011 were unfavorable for salmon and characterized by a minimum level of water in a cycle of 7 years. In mid-summer salmon took their places among the rocks on the main stream. They have ceased the respond to the flies, and the river looked blank. 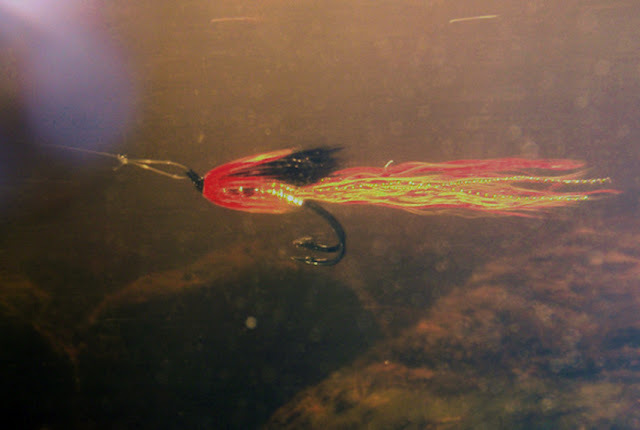 Perhaps, in the crystal clear water fish could perfectly see all the disadvantages of artificial lures. We have experienced a different flies and a variety of methods of presentation, but did not achieve a good result. Fishing the film surface of the water helped us a lot. Dry fly, such as CDC sedge, remains close to the water surface after getting wet. If you slow down a little drift of the fly, it forms a small bump on the surface. This trail on the water is visible and can control the movement of flies. Just above the salmon fly can stop the drift, which is on the surface. George demonstrated to us that salmon attacks the fly directly at this point. Distance casting is no more than 5-10 meters. It`s possible to approach carefully among the river stones and fish sensitively all possible hiding places. Salmon ignored the thick tippet flies. The best were thin nylon or fluorocarbon diameter 0.20 - 0.22 mm. Of course, we lost some big fish. In such circumstances, it is very difficult to land a large salmon. But to fish them in this way is extremely interesting. What fly or color was the best – difficult to guess. It is possible that the hump, mark on the surface of the water was the main precipitating factor. 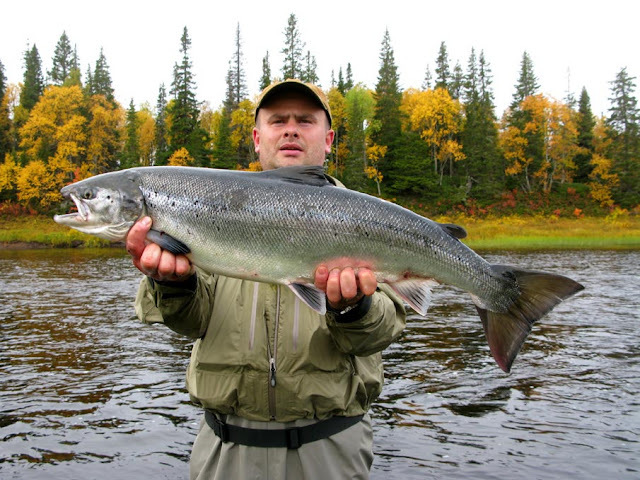 There is a method of fishing salmon on the wet fly that is similar in terms of presentation to the above. This method of provocation, described as a riffling hitch. It was very popular once. There are many nuances and it is used not only in salmon rivers. There is a way of fishing - a “local” method, which occurs quite often, along with the method of wet fly. It is used in many different ways with salmon, and other classic wet flies. It needs a generic floating line, which is convenient to make some mending and other manipulations. The point is, that it would suspend the fly drift downstream. Practically the method of wet fly is available in sector 30-45 degrees. It is not possible with inadequate equipment to deploy immediately a fly in working position, and sector work effectively narrowed down to the foresight of 5-10 degrees. It happens in the strong stream, when all bites occur almost only directly below us the river. If the stream is monotone and uniformly, it is not a big trouble. Line will be straighten at the end, leader and tippet tighten and fly starting to work. But if we are fishing a particular place, we have to climb into the water directly upstream the target, otherwise the fly will come out of a promising band. If the correct line, mending it upstream, can quickly put a tippet and the fly against the stream even when cross-cast, you can stop and hold the fly at desirable place. At high water levels, for example, early in the season, usually used an aggressive diagonal presentation of a large flies to handle a large area or a large volume of water. A local fishing gives result just in medium and low water level. It is well suited for fishing, where we can localize the position of salmon. You can use any major provocative fly. But it is indispensable for delicate fishing capricious fish. It is important to slow down the speed of small fly and keep it in sight of a salmon, that would be enough time to attack. Such an alternative technique is useful if salmon do not want to attack flies of normal size. If you follow the path of further enhancing the presentation, you can recall the method of aggressive wet fly fishing and its variant with fast strips. The method is described for the provocation of a summer fish, meaning inactive salmon. But if we move from the classic wet flies and salmon flies to the streamer, it was found that the technique is good for the deepest parts of the spring and into the cold water in late autumn. In this way, casting across the stream, we can processed quickly a larger area in search of active fish. The method of deep streamer is similar in the square fishing to method mentioned before. It was originally used to fish sea trout, it was necessary to put the fly and hold it near the bottom. Doing everything the same way for the salmon fishing too. Standard tackles applied as for the wet fly fishing with fly on a short tippet, which runs along the arc of the entire width of the river. It does not require strips, it is necessary to make a cast across the river, mend the line downstream and water gives us correct accelerated presentation. Fly activation to work correct requires careful selection of candidates among the flies. On a fast, powerful current, flies should be rather rigid, three-dimensional elastic elements. For the quiet calm and balanced current, which holds big population of salmon in spring, we need a different flies and a different method. The force of water is inadequate to keep the usual salmon or wet fly. The rod must literally be able to keep the bait. This kind of presentation is mentioned in the literature as working the fly. There is a woolly bugger type of flies with the moving elements from marabou feather, chickabou and other soft material. I had salmon bites on marabou while fishing trout. My buddy used the woolly bugger specifically on Chavanga slow pools fishing during last summer. The usual salmon flies during the hot day didn’t give the results so he put the marabou and fish quite well. That is why I remember this case, however, I want to add that he used the usual wet fly method. In these examples, there is nothing unusual. Just along with the conventional method of wet flies, there are options that we have, for some reason, rarely apply to the salmon rivers. I have deliberately not trying to give a definition of salmon flies. Fish knew nothing about them too. Our goal is different. The question should not put the interest of flies, but reaction to different objects. It is easier to understand the place of artificial flies and lures among possible to understand the mechanisms of their action. You can talk about the role of "salmon" flies or that you should not ignore the "no salmon" flies. In recent years, I once again drew attention to the stereotypes of fishing. Walking next to the buddy, who came to Chavanga for the first time, I saw his mistake in choosing fishing spots. Chavanga river changes extremely from the mouth and upstream and gives us quite different in character parts of the river. Without knowing the features of the river, my friend went into the water not where needed. He has been fishing for a while in the bad spots and quickly went away of best places that I have shown him. In the end, he put up with my remarks and to our common joy he caught his first salmon in his life. In the following days he was well oriented and the result was very stable. Good place with some experience becomes evident. A good place is always filled with fish and those vary from "bad" places where there are no strikes and no fish. Therefore, a person who knows differ parsimony movements in contrast to the action of beginner. But this precisely correct, error-free selection of sites has a mistake. Throughout the year, salmon move along the river looking for the best seats. Constantly the residents mix with fresh sea running fish. Of course, strong and large individuals occupy the best seats. But they are the best for the future breeding or better to be allocated safely? Sometimes we keep staying in vain in the "good" places where there is a lot of active but small fish. And these monsters are alone, without reacting to pass by fishermen and their flickering away flies. Therefore, the beginner is always have a chance to catch a trophy salmon. This is happens every year. I think that not an expectation of the bait, but the contact with the fish teach us how to fish. If you really want to catch a trophy fish, the choice of location is not the only factor to consider. Of course, it is simply the most obvious, and in fact plays the role and nature of the flies, and time of the day, condition of the river and so on. The second stereotype is associated with an attempt to repeat the techniques of fishing. Most anglers are planning to come back to Chavanga and Strelna again. And rightly so. We need only to remember that the river is not the same twice. And to avoid disappointment, we must try to understand how the river has changed and what needs to be changed in salmon fishing to get a pleasure of it again.